Lucky for projectors being the smallest is a good thing. Optoma says its newest 4x2 inch PK102 actually is. An upgrade to its Optoma PK101, it is now thinner but managed to squeeze in 4GB of storage. 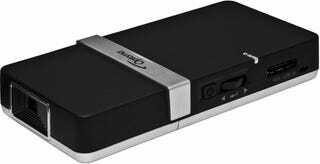 Besides now being able to hold pictures and video, the Pico PK102 also now has a new universal port capable of receiving VGA and component video. This should make connecting it to a laptop easier and the component port will let you hook it up to your iPod or portable gaming device with the bundled cords. Other than that there aren't any substantial updates — it still got the same 480 x 320 native resolution and a DLP engine as the PK101.